I am an elementary school media specialist (librarian) and a new mom. My daughters (born 12/27/2010 and 6/27/2013) are teaching me all kinds of new things every day. One thing they have taught me is that sometimes, there just isn't room for much else besides learning. If you're not sleeping, eating, talking, blogging, or whatever, it might just be because you're TOO BUSY LEARNING! And, my grand entrance back into the blogging world (shortly preceding my grand exit, in all likelihood) will be made with a crafting project for The Pintester Movement. 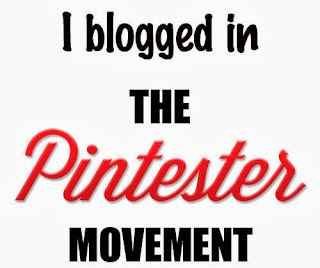 If you have never seen Pintester, you should do yourself a favor and check it out! Your intrepid Pintester is none other than my fabulous sister, Sonja Foust. But I'd read her blog regardless of our shared parentage. It's hilarious, even if you're not into crafting -- maybe especially if you aren't. As you know, I do not blog in part because I am too busy with my girls. 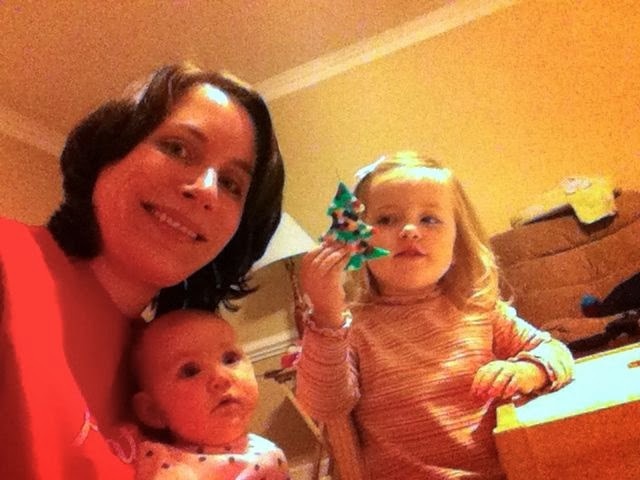 I have my Neve, who will be three years old on December 27, and my Ruby, who is four and a half months old. Both girls rock, but in a way that pretty much requires my full 24-hour attention, especially while I am on maternity leave until January. Currently, Neve is playing with her sister while I peer over my laptop screen at regular intervals to make sure everyone is still alive. 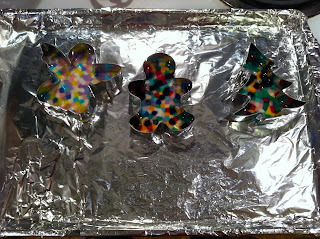 Basically, you drop pony beads into metal cookie cutters, bake until melted, and voila! 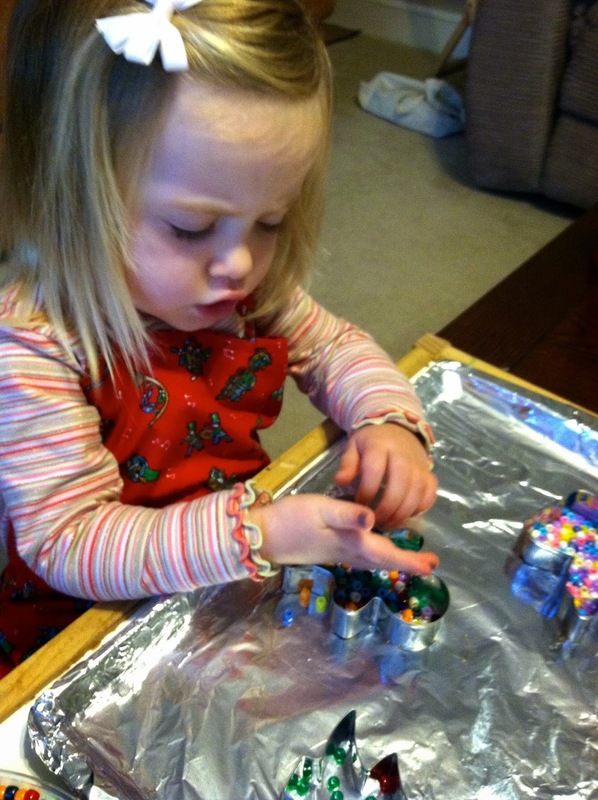 Toddler crafting requiring no painting of body parts. Step 3: Show toddler what to do. Know that she will go completely overboard. 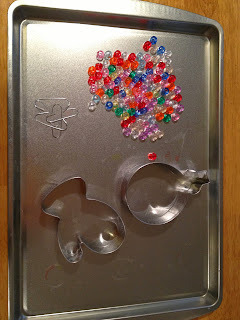 Tutorial suggests "one layer" of beads. Toddlers do not understand this concept. Also, know that your toddler probably will not care to differentiate beads by color. "Let's make the tree mostly green," might as well mean, "Dump a handful of random beads in that sucka." But she will look good doing it. 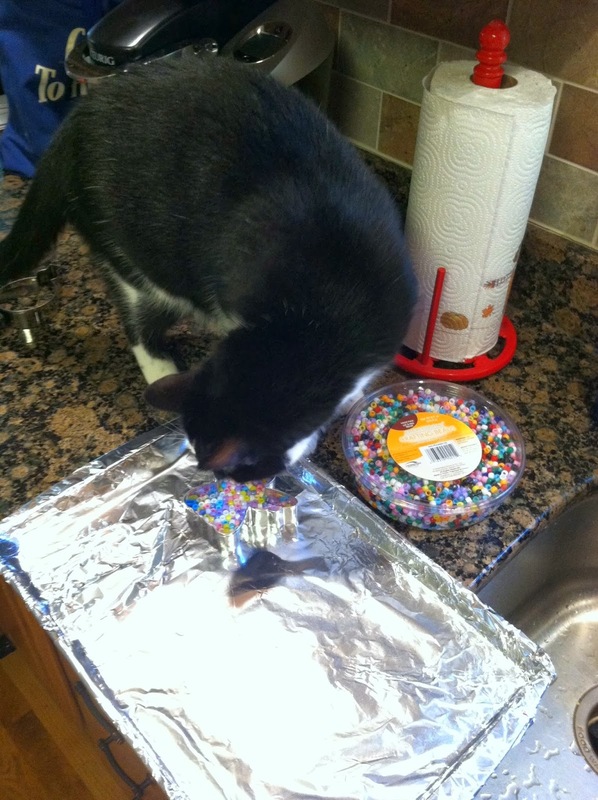 Step 4: Sneakily redo everything the toddler just did. Not really. But kinda, yeah. 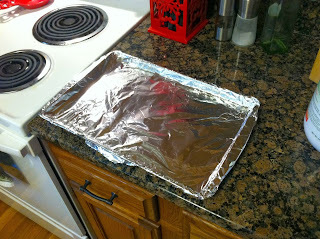 Step 5: Bake at 425 degrees for 20 minutes or so. Open a window; it's stinky, but we didn't die. 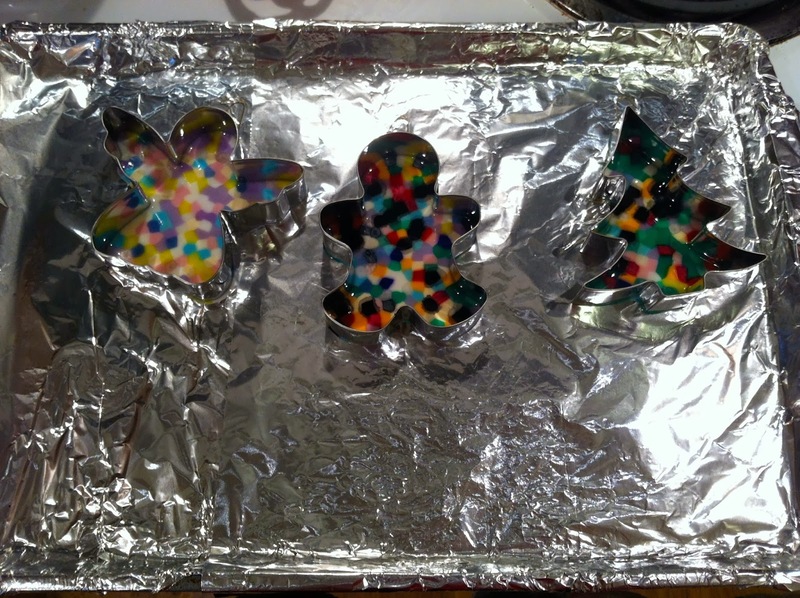 Step 6: Wait until they cool completely, and pop em out. Step 7: Show it off. This is the one we're sending to Cheeseblarg because I enjoy the irony of decorating one's tree with a tree. So, thanks Pintester, for getting me back on the blogwagon, even if it is just one post. We had fun, and since you're our loving Auntie, you might be getting a melted bead ornament for your tree this holiday season. I pretty much never blog. Ever. But I wanted in on the upcoming Pintester Movement, so look for a new blog post from me on November 15 telling all about how the girls and I made a craft from Pinterest! Hoo boy. By way of preview, I will tell you that I have fans running and windows open in my house right now. For those who used to read this blog, and this might pop up on your Feed Reader... This is an activity for a class I am taking on the NC Essential Standards for Information and Technology. I will be linking the IT Essential Standards for 5th grade to the Science Essential Standards for 5th grade. If you're not an educator (or even if you are), you may just want to bypass this one. I won't make any promises about posting anything else, but maybe you'll hear from me again before another two years pass. Who knows? ITES: Use various sources of information to complete a task, making sure that the resources chosen are relevant and reliable. ITES: Use appropriate and differentiated strategies to read information in a variety of formats and genres. Science Connection: Again, the ITES objectives would best be met in the context of a research assignment. See above for Science Standards that would be best for research. ITES: Use technology tools to gather, organize, and present information. 5.P.1: Force & Motion -- Students can watch demonstrations and experiments online or using the Discovery Education Techbook, making predictions as they go with the teacher facilitating discussions. Students can also create a graph using any number of technology tools (5.P.1.3). 5.P.3: Heating & Cooling Matter -- This standard requires the students to explain the effects of heating and cooling. After conducting investigations, students can use technology tools to create and publish their explanations to demonstrate understanding. 5.E.1: Weather Patterns -- Technology is an absolutely essential tool for students to be able to collect and compare weather data so that they can make predictions. ALL: Really, technology could be used as a tool in teaching any standard. With so many ways for students to gather, organize, and present information using technology, the possibilities are endless. I would say that for this IT Standard, the teacher should just be careful to make the use of technology as authentic and practical as possible. For example, students need not be required to type lab notes when a pencil would be just as effective. BUT if the students are to explain a concept, the teacher may wish to have a student create an informational blog post so that he or she can receive some authentic feedback. ITES: In 5th grade, students need to be able to carry out a research process in collaboration with others. Science Connection: See IT Standards 1 and 2 for a list of Science Standards that could be taught well within a research project context. In order to encourage collaboration, many of these standards could be broken up and each student or group assigned a small piece of the objective. When students present their work to one another (hopefully using technology tools that would encourage authentic feedback), they can be held responsible for what is being presented as well. ITES: In 5th grade, students should understand how to be responsible with hardware, how to use information ethically, and how to be safe on the internet. Science Connection: For any published research (written, posted, etc. ), students will need to understand the IT SE Standard. See IT Standards 1 and 2 for Science Standards that could be used well in a research project setting. Again though, this standard could apply to any Science Standard in which technology or information could be used -- practically all! When we were in library school, we were taught that we needed to use a research model to help our students learn to conduct their research using a process. Most school librarians end up using The Big6 or, for the little guys, The Super3. I myself have, in fact, used these models in teaching lessons, although I have had limited success with Super3 and almost no success with Big6. Just try saying to my 5th graders, "OK, guys, our first step is 'task definition.'" I dare you. You will immediately realize it's going to take a whole 40-minute period to explain just this one step, let alone the other five. Amanda Jones, a school librarian like me(! ), has come up with a great and quick way to teach Big6 skills to elementary school students in a limited amount of time -- even kindergarteners. The original Big6 steps are task definition, information seeking strategies, location and access, use of information, synthesis, and evaluation. Whew! That's all well and good for librarians, but for elementary kiddos, not so much. During the session, Amanda gave several awesome examples of very short (two or three 30-minute sessions) research projects with cool products done using Big6 strategies. Her visual aid that she carries from grade level to grade level for consistency is a staircase with a step on each stair. Since we use Thinking Maps at my school, I have mine in a flow map (like a timeline, basically) for my first Big6 lesson on Monday. Either way, she reminds us that it's important to stay consistent if we want kids to remember the process and build on it from year to year. Over the course of the next few days and weeks, I plan to share a little bit of what I learned at the American Association of School Librarians (AASL) Conference last week. I was thrilled that our national conference was held in my home state this year so that I could have the opportunity to go and enjoy! Each of the following blog posts will highlight a concurrent session that I attended. I hope this information will be helpful to some of you out there in school libraries, and maybe just interesting to some of the rest of you. The first session that I would like to highlight for you was called My Librarian is a Camel: How Children Around the World Get Books. 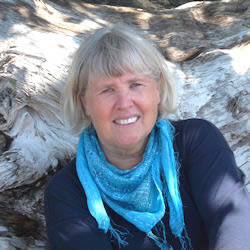 The session was led by the author of the book My Librarian is a Camel, Margriet Ruurs. Margriet, originally from the Netherlands, was charming and fun to listen to as she told us about all kinds of nontraditional ways that children have access to libraries around the world. Read the book for more on that. One cool project that I'd like to try with my students is called A Book Marks Our World. It's basically a bookmark exchange program, so that children from all over the world can connect with one another via their shared love of reading. I do recommend sharing Margriet's book with children, although it's a little long for a read-aloud. I like to hit the highlights of just a few featured countries when I share it. Students love to check the book out and go back to read for more details about their favorite mobile libraries. We have unofficially designated summer as home improvement time. This summer, we decided the most pressing item was the ceilings. The popcorn spray throughout the house is peeling, so we're having it all scraped off, sanded down, and repainted. And since that is a totally boring home improvement, and we had to call a painting company anyway, we're also getting new walls in the bathroom. Right now, they're some sort of weird tile board with an even weirder chair rail slapped right in the middle of the wall. The tile board is coming down, our wonderful contractors will repair any damaged sheet rock, and then they will repaint! I picked out a new shower curtain and paint color today. My paint color is the second one from the top in the photo. They're coming to work on the house while we're away on vacation, so I'll post the "after" pics when we get back! And just for fun, here's the guest room bed with all of the stuff emptied out from the bathroom cabinets, as well as all the "knick-knacks and valuables" from the living room and kitchen. This is an old, old piece of mine, written for a Brit Lit college course. Sonja has requested that I post it. A harried college student meeteth three other students who hath all completed their studies for the evening and are on their way to Tate Street Coffee, and detaineth one. Who stoppeth one of three. Let go, and then be quick to flee! “There was a disk,” quoth he. And flippeth him the birdie. The Coffee House pilgrim gets caught on a nail on his way past the harried student, and is constrained to hear his tale. He heads on past but lo! What’s this? The pilgrim has been stopped. Who cannot choose but hear. But fears that it will tear. I typed straight from my heart. The student tells how he began to type a long, long, long paper. And all my mind was drained. For he would but could not run. The young man goeth into caffeine withdrawal; but the harried student continueth his tale. As they are not his mother. On the verge of crying. The paper is eateneth by a computer demon known only as the infamous Operator Error. And caused no little strife. For I am a rather large dupe. And now I feel like poop. And then I saved once more. The harried student goeth into shock. The harried student catcheth sight of such a nerd, one Alby Tross, and recieveth him with great joy and hospitality. He would not help me through it. Begging him to do it. And lo! Though Alby Tross proveth at first to be a nerd of good omen, he quickly proveth otherwise and earneth the wrath of our harried student upon his head. Though I be neck-deep in it. I could not cope at all. The harried student inhospitably beateth the pompous nerd of good omen within an inch of his life. And whacked him with a drinking straw. And make him cry, of course. My essay that printeth I should. He crieth out in anguish and sorrow, for beating the nerd of good luck. That could my problem know. That could my problem know! But when the guilt weareth off, he justifies the same, and thus screweth up his life all the more. And I let out a cheer. And I let out a cheer! It appeareth that the harried student hath recovered his toil of many hours. To finish up the story. The computer hath been suddenly locked up. The window glass with my scream! That heinous essay mocks me. Revives himself and socks me. Or a maxed out Stat 101 class. And Alby Tross begins to be avenged. Man, I need a drink! My very soul did wilt: O drat! I’ve nothing to show for the night. If it means he can only be free. (Though not a sea, literally). And to teach, by his own example, love and reverence for all things (and nerds) that God made and loveth. To thee, thou addict of coffee! Turned back to his own dorm. I am an elementary school media specialist (librarian) in Greensboro, North Carolina. You can expect to read here about all kinds of things that make my librarian heart happy.